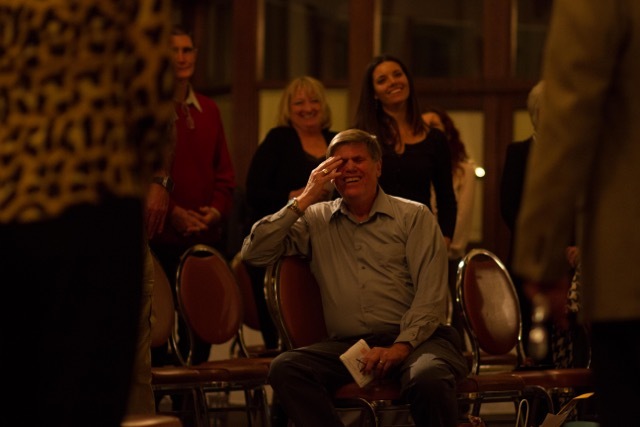 A retirement ceremony was held Dec. 19, 2014, for Dr. Alan McThomas, director of the California Baptist University Counseling Center for 16 years. Friends and colleagues of McThomas gathered to offer their well wishes and final goodbyes at CBU’s Staples Room. Hugs and genuine greetings set the tone for a night dedicated to the highly esteemed McThomas. The ceremony began with a warm welcome from the current Counseling Center director, Jeff Biddle. “There’s a legacy and a rhythm from your love, your giftedness,” Biddle said. Counseling Center office manager Julie Greenwalt followed Biddle and shared letters from past interns who had been deeply influenced by McThomas during their time at CBU. Greenwalt also shared stories that demonstrated the sense of humor for which McThomas was known. Mark Cox, supervisor at CBU’s Counseling Center, expressed his love for McThomas by referring to him as a brother in Christ. “The touching of lives you’ve done is miraculous,” Cox said. Counseling Center supervisor Nicki Bywater also referenced McThomas’ humor using props with a memory attached to each one. She held up a coffee mug, reminiscing about the many times McThomas left coffee droplets around the office. Another prop was a block of bird feed that represented a time where McThomas let a bird fly into the counseling office, then proceeded to run around the office trying to catch it while clients watched.